It is realllllly crazy to me that we are technically at full term and that baby could come any time now! Although I’ve been having some more Braxton Hicks contractions and the baby is sitting a little lower it doesn’t really feel like that much has changed since my last update though. Last week my co-workers surprised me with a lunchtime baby shower, which was so adorable! I wish I had taken some photos, but I was so surprised I totally forgot about it. They had decorated our little conference room with balloons, confetti and cake, and gave me some wonderful gifts. It is going to be so weird not to see them everyday for three months while I’m on maternity leave. We also had a baby shower for Geoff’s side of the family last weekend, and it was so much fun to see everyone. There was so much delicious food and the decorations were really cute (it was a blue theme for our little boy). We got some more much needed baby items, and I’m definitely feeling prepared for baby now. One of the gifts we received was a Safety 1st convertible car seat, which reminded me to schedule our car seat safety checks at the hospital. Luckily there was one spot still open between now and our due date, so I booked it right away. We now have one week to attempt to install our two car seats before we head over to have them tell us if we did it right or not. Apparently 90% of car seats are installed incorrectly, so it is really nice to have someone be able to double check them for us! We had a doctor appointment yesterday and I had another blood draw done to see how my platelet levels are doing. The range for a normal platelet count is 140-450, and mine was originally 133, which is what prompted them to start monitoring me. I did another blood draw a month later, and my levels went up to 137. Higher, but still not in the normal range. Four weeks after that I was at 141, barely squeaking into the low end of the range. As for my latest, my stupid platelets dropped all the way to 131, the lowest yet. I still think I’m in the clear for an epidural (if I decide I want one) since my levels are still higher than 100, but it still makes me a little worried. I guess I’ll just have to keep doing blood draws and hoping my levels get higher as we get closer to my due date. Cross your fingers for me! Your doctor may check for labor signs, while your baby prepares for birth by sucking, turning, and breathing in the womb. Congratulations! You’ve got what is officially considered a full-term baby, even with three weeks to go. That doesn’t mean he’s finished growing — in fact, he’s still packing on about a half pound a week (at this age, the average fetus weighs about 6.5 pounds). That makes it a little crowded in your uterus, so he’s probably not kicking as much, though he’s probably stretching, rolling a bit, and wiggling (all of which you’ll be able to feel!). Right now, your little superstar is busy rehearsing for his big debut, inhaling and exhaling amniotic fluid (to get the lungs ready for that first breath), sucking his thumb (to prepare for that first suckle of milk), blinking, and turning from side to side. Your body is going through its own preparations for childbirth as your practitioner starts looking for signs of labor. On the checklist: the baby’s position in relation to your pelvis (engagement) and whether effacement (thinning of the cervix) and dilation (opening of the cervix) have begun. Your practitioner may also determine whether your cervix has begun to soften, another indication that labor is getting closer. Keep in mind that these processes can occur gradually (over a period of weeks or even a month or more in some women) or overnight. So while they’re clues that you’re indeed progressing, they’re far from sure bets when it comes to pinpointing the actual start of labor. « Week 36: Happy Halloween! Seems a little shocking that baby went from a honeydew to a beach ball in one short week! 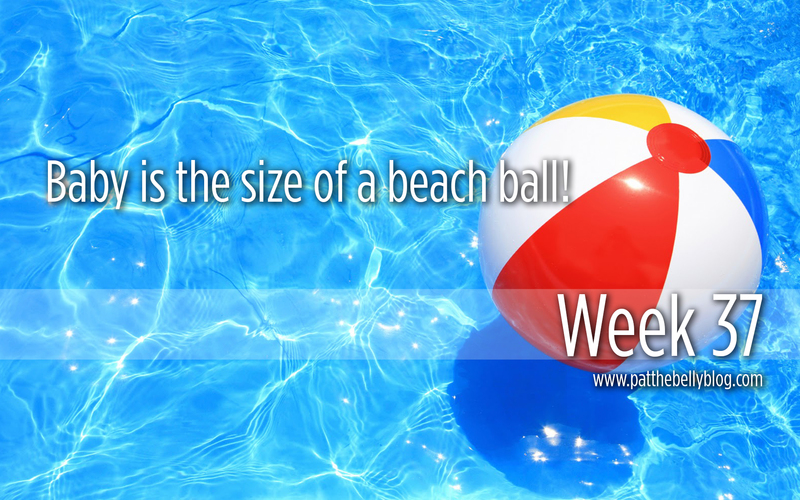 Dad and I are so anxious to hold and love your little beach ball – won’t be much longer now! Hope you continue to feel as good as you have been, and we’ll get on our knees about those platelets of yours. Big hugs!